… and in this house we’ve had top loaders with cabinetry above them. Here are the new guys sitting pretty (although not quite as pretty as the others since we haven’t tackled the rest of this nook yet). We loved having a counter over our first house’s front loaders, but it usually ended up cluttered with stuff (it became sort of a dump-this-here-until-we-deal-with-it-later zone). And this setup required the most bending, which wasn’t that bad at the time, but now that we’ve had top loaders a while, we definitely can appreciate less of that. Our stacked loaders were nice because we had cubbies for storing everything we needed, which didn’t tend to get cluttered like the counter (there just wasn’t space to drop grocery bags, returns, and other random items there). There was still a fair amount of bending and lifting when it came to doing laundry, but again – at the time it was just fine, and we really only realized how nice top loaders were once we moved here. The obvious con to top loaders is that there’s no place for a counter, which we did really like having, but we still have the top of the dryer to work with (we can put the laundry basket there for example – or lay things out to air dry). The cabinets might be our favorite storage solution (as compared to open cubbies or pull-up blinds) just because everything is tucked out of view but still really easy-access. *Note: We got some questions on Friday’s post about why we don’t bring our appliances with us when we move. It seems to be one of those regional things. 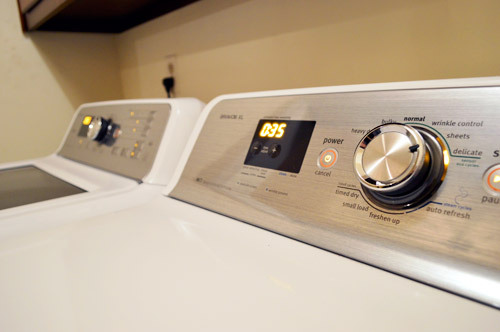 Here people tend to leave them, but it’s not like you leave nice ones without getting anything in return for them – it’s just factored into the listing price here (a seller can command a higher asking price by saying “there are new top of the line appliances” which obviously add a lot of appeal/value). But now onto our new washer and dryer! When it came to delivery, the guys were really nice, although I did realize about half-way through it that I needed to lay down a dropcloth to protect the runner, even though they wore those nice little shoe-booties (the runner was getting dripped on by the old appliances as they came down – but it was thankfully nothing I couldn’t just wipe down to remove). With the booties/dropcloth combo it looks like a slip-n-slide situation (I begged them to take off their booties because I was afraid they’d fall) but thankfully they went slow and steady and all was fine. Turns out I’m just a worry wart. 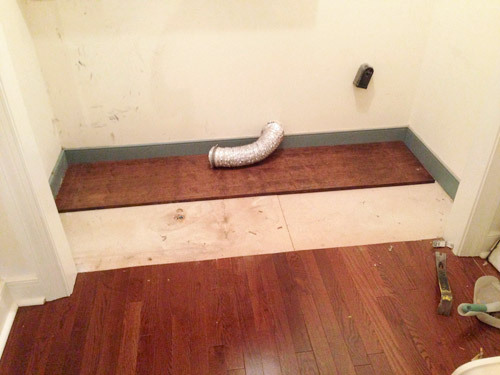 You might remember that we couldn’t wait to get the old appliances up and out of there so we could finally replace the old pan under the washer and remove the remaining carpet scraps that were sitting under the dryer. We decided that laying down some thick 3/4″ plywood (which is the same depth as our hardwoods) would be a nice way to give that particle-board subflooring a more finished look – especially since we could stain it to match the floors so well (we used one coat of Dark Walnut followed by three coats of SafeCoat Acrylacq to seal them). 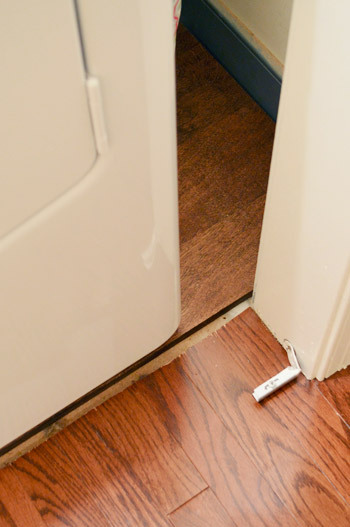 We actually added plywood under our last washer and dryer (more on that here) since we heard it was easier on them to have reinforced flooring (something about them lasting longer) so we’re hoping it gives these a leg-up. Then we had to get the boards down. Here’s the first one going in. We had pre-measured them and stained/sealed them beforehand so they were all ready to slide into place when the appliances came up. When you step a little further back, you can hardly tell it’s not the same hardwood flooring running under those appliances (we didn’t photoshop the crack out of this pic, it’s just barely noticeable from this distance). And we’re really happy with how well the color matches. We also plan to add some nice white folding doors (there were some blue ones hanging there originally) so that’s another reason we thought the subtle flooring change should work really well. As for leak protection, since these guys are on the second floor (and we REALLY REALLY don’t want them to cause damage to anything below them, we were sure to place the washer in a plastic water-catching basin and also upgraded to those nicer reinforced steel water lines instead of the plastic ones. The crazy thing is that during installation there was actually a small leak where it was attached to our water line, but we caught it while the installer was still here, and he ducked back there and fixed it by tightening things a little. The lesson? Check those lines! So now onto the fun stuff: how we like our new washer and dryer! Well, we LOVE the dryer so far. It has been quieter, has a much larger capacity, doesn’t shrink things nearly as much as our older one did (that one practically “burned” things and this one has a heat sensor so it doesn’t over-dry). I also love the charming little chime sound it makes when it’s done (which can still be silenced, but it’s so much better than the loud buzz that our old one made). We also really like the digital setup of the washer and the dryer. It’s easy to see things, like how long each cycle still has left. The washer’s capacity is also really awesome. It fits a lot more than any of our previous models (especially the old one we were replacing). And now for the womp-womp. Remember how I worried that bad things happen in threes? Well, our new washer is broken. I’ll pause for effect, as I quietly weep into my dirty laundry pile. The installation just included starting it to make sure there were no leaks when it filled up, but they didn’t stay to watch it run a full cycle (which is completely understandable… that would be close to an hour of washer-watching time). So imagine our surprise when we ran our first real load of laundry well after they had pulled out of our driveway and heard a crazy-loud grinding sound during the wash cycle (whenever the agitator is moving, there’s this jarring metal-against-metal sound). You can hear it all the way from downstairs with the TV or radio blaring. I woefully called Home Depot to tell them we already had a problem and they told us to call Maytag, who told us they could get a tech out in seven days. Ack! A full week without a working washer after buying a new one and expecting it to run without issue? I sweetly asked if they could get that service call moved up a bit since we were expecting a working machine upon delivery (our laundry had built-up a bunch already, so the prospect of another seven days of waiting stunk) and they said we could call Home Depot and see if they could do anything. I explained that I called them first, but would try one more time. Well, when HD heard it was going to be a week until Maytag could make a service call (which might not even fix things, it might just diagnose that I needed a new machine, which then had to be ordered) – I could feel them trying to work something out for me, which I really appreciated. They had mercy on my sweet laundry-missing soul and agreed to take back the first one and deliver a new one on Thursday. I’m really happy with Home Depot’s customer service (I’m sure it’s a lot easier for them to just say “call Maytag, it’s a mechanical issue that they’re supposed to handle) and I have to be honest that I wish Maytag had been able to come out for a service call within 48 hours or so, which is what I expected when my brain reached that “oh snap, our brand new washer is broken” moment. 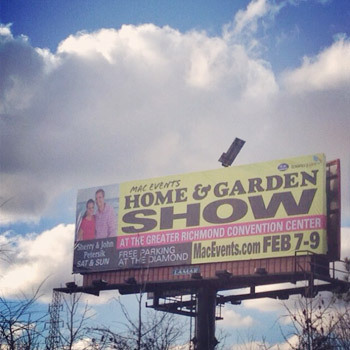 Sidenote: We’d love to see you guys this weekend at the Richmond Home & Garden Show! We’re speaking at 2pm on Saturday and Sunday (with a book signing following Saturday’s talk). You can get half-price tickets online right here. Oh and they gave us the shock of our life when we were driving down the highway and saw our giant faces on a billboard. Seriously, we screamed so loud it probably scared other drivers. It’s exciting, unbelievable, and terrifying to see your own mug that big. also, I’d be surprised too if i saw my face on a billboard! Were you aware that you would be up there? Nope, no idea! We also just heard our names on the radio when someone was talking about the show and we were like “did the radio just say “John and Sherry Petersik? !” – so crazy! You mean they didn’t ask your permission before they posted you up like that?! crazy! When you agree to speak at a home show you provide an image of yourself, knowing they’ll use it to promote the show, but you never know where it’ll pop up! We never imagined they’d do billboards, but we don’t mind at all – it was just a shock at first! Haha! Oh I need to know what that noise is! We moved in our home about 6 months ago, and our washing machine has been making almost that same noise since we have been there. The machine works fine, but it sounds like someone is beating our house down, or a robot is trying to climb out of the machine. Hope it gets fixed quick! Arrghhh! I would have literally cried when I heard the grinding noise. You guys are amazing for pulling off the floor switch-o-roo so fast. I’m super glad HD handled it for you. I dream of the day we can buy a new energy efficient washer! Oh man, never! I’m shy about having complaints, so I like to be as anonymous as possible when making these sorts of calls (I’m the girl who apologizes when I’m making a return, haha!). John is even more shy, so I’m known as the “negotiator” around here, but I just like to use logic and see what they can do for me (ex: this washer is new, I thought it would work when it arrived and I’m sad that it’s broken). I think it would actually be really lame if companies helped us out just because of who we are – they should help anyone out who has an issue with their product! I 100% agree with you and have had nothing but awesome customer service from Home Depot (and Lowes). So glad that you’re getting your washer fixed/replaced. That’s also why I always get the extended warranty- it definitely pays for itself especially with all of the electronics, buttons, and panels that can fail on these fancy new machines. I disagree about the extended warranty. Consumer Reports says these are “notoriously bad deals,” since a product that’s going to break usually breaks within the regular warranty period (like this new washer just did). (http://www.consumerreports.org/cro/extended-warranties/buying-guide.htm) Also, on general principles, I don’t think it makes sense to buy insurance (which is basically what an extended warranty is) to cover a risk that you can afford to take. Yes, you risk having to pay for a repair, but a repair isn’t going to bankrupt you. Plus extended warranties tend to be loaded with exceptions, so there’s a good chance a repair won’t even be covered. I would stay anonymous on the phone too unless I had bad customer service. Then I probably would have hollered “my face is on a flippin’ billboard.” I forgot about Reese Witherspoon- too funny! Oh what a bummer! I can’t believe your bad luck! Hopefully it’s just a lemon and your new new washer will work like a dream. Fingers crossed! I keep saying to John “can you imagine if the new one comes and it does the same thing and it’s an entire bad shipment or something? !” – I like to think since it’s a third bad thing that our luck will turn around though. Here’s hoping! That’s funny- maybe we just have bad luck with Whirlpool washers, but I bought a Duet washer and dryer from Lowe’s with the offered extended warranty and exactly 1 month before the warranty expired, it completed died. I ran into some issues because we purchased both items at an incredible sale price so Lowe’s would have lost money by replacing the washer and they just wanted to cut us a check, but eventually I convinced them to replace the unit. They gave me another Duet washer and 1 year and 2 months later, the digital panel broke (exactly why I cringed when you said you searched for that feature). I didn’t realize that the second machine didn’t come with the same extended warranty (idiot). Lowe’s suggested I contact Whirlpool since it was so close to the manufacturer’s warranty, but no dice. Eventually I think Lowe’s took pity on me (being overly pregnant and chasing my 2 year old around their store) and offered me a brand new unit that was a bit bigger and better at the cost of the upgrade (~$100). With our luck, I was happy to purchase the extended protection again. I much prefer to deal with the stores than the manufacturer’s and Lowe’s has officially won all of our future appliance purchases!! I <3 Lowe's. That’s so nice of them! Glad it all worked out! Maybe it’s just cleaning the clothes REALLY HARD. What a bummer. Glad Home Depot came through for you. Where is Burger during all of this excitement? Haha! Burger BARKS like he’s a doberman and then hides like he’s a mouse. Haha! What a huge letdown to have dealt with everything and be left with a broken washing machine. My washing machine is a hand me down from when my mother switched out to front loading ones. It’s ancient and dribbles a little water out with each load. However, it’s in an unfinished basement and leaks next to a floor drain, so I live with it. It would be nice to have something pretty, but I’ll take functional over pretty any day of the week. 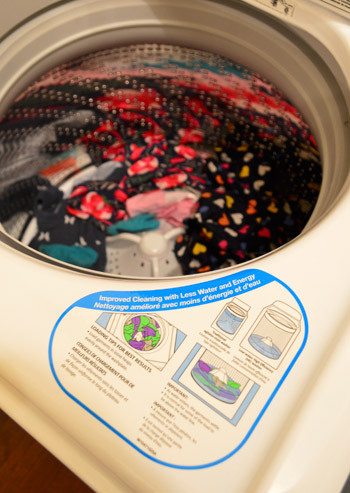 If you never had a working washing machine, then what were you drying to know that your new dryer already doesn’t shrink things as much as your old one? Oh, duh. Thanks for clarifying. This happened to us TWICE with our top load just like this but whirlpool before we bought our house. It broke a week after we got it – the lid locked shut halfway through a cycle with a water filled tub. Yikes! And again a few months later. We had to come up with a way to crack open the lid so we didn’t ruin our clothes because they wouldn’t come out to diagnose for a week! It was so awful and I also was never so excited to do laundry. When we bought our house it came with front loaders (also whirlpool), and knock on wood, they’re still going strong a year later. Hope this gets fixed soon! I feel for ya! Sorry that its been so rough! Hopefully you are on your way to clean laundry bliss. I have a quick question on your washer. Does it auto lock as the cycle starts? I think all models do these days but it REALLY makes me want an old one that did not do that. I’m constantly dropping that one item on the way to the laundry room and needing to throw it in quick after the cycle started and I actually like to add detergent after the water has filled. Darn safety standards! Yup, it auto locks, but if you hit stop it drains and unlocks. So smart! See, I’m still learning. Haha! I know the auto lock is annoying, but….it’s a safety feature. And, I beg everyone who’s reading who has children or pets – before you turn on that washer or dryer, BE SURE you know where those kids/dogs/cats/bunnies are. Be absolutely, positively sure, please. 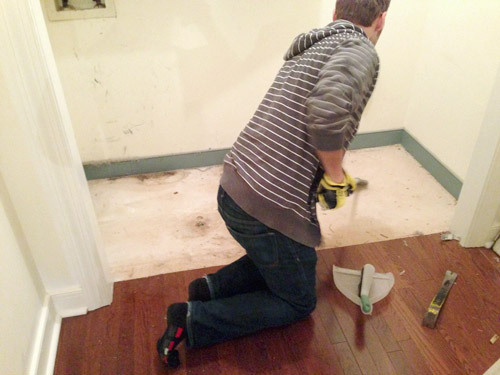 You guys are like magicians swapping out that flooring in between appliance moves! It looks awesome! I would’ve FREAKED and told them to bring me a new washer ASAP as soon as I heard that noise. I’m not laid back like y’all! LOL But I’m glad they agreed to replace it anyway and not make you do a repair. I don’t know if you guys got extended warranties but we did through HD on all of our appliances and they’ve paid for themselves 5x over. On major appliances, it’s a must for us. We would’ve racked up $1800 in VERY minor repairs this month alone. Our warranties expire in 3 weeks so I’m SOOO glad we got them for $100! Wow, thanks for the tip Anele! We have 30 days to add the extended warranty, and I gotta say that scares like this make me want to run to them and do it! MAJOR bummer about the washer! :( I saw your billboard when we were up in Richmond about a month ago and my husband didn’t understand why I was so excited and squealing!then he said, oh are those the house love people? :) We live in Williamsburg, so I’m hoping we can make the trip up to see y’all! So fun. Ahhhh! It’s so crazy! And we only thought there was one and then we were going the other direction one day and saw another one and got scared all over again! Haha! Where there any transportation screws that needed to be removed before running? We’ve had a problem similar to this, but luckily an easy fix! I was just about to suggest the transit bolts hadn’t been removed as well. This happened to friends of ours who had their washer delivered and installed, and were told it was good to run. The first load made an incredible noise. They thought it was faulty, but it turned out that the installation guy had just forgotten to take them off (we all make mistakes at work every so often, right?). Check the instruction manual and make sure those bolts have been removed. Checked! Sadly that’s not the issue, but I wish it were that easy! I’ve seen your billboards around town! I think the overall design of them looks so cheesy! but I love it :) I haven’t bought tickets but I may decide to come and see you 2. Wahoo! Come on down Robin! What a bummer that your brand new washer is busted. I hope the new one has no issues. I can’t wait to see your opinion of your functioning washer. 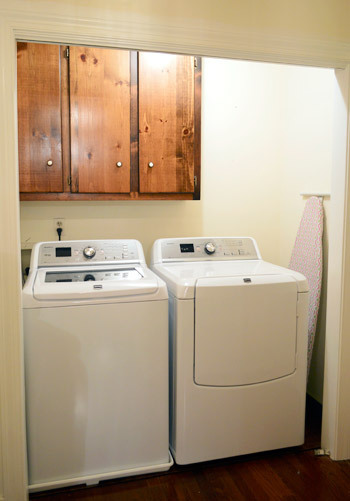 I’m leaning towards purchasing this washer and dryer for my new laundry room remodel! When we bought our riding lawn mower from sears, it was delivered with a flat tire! Hubby made them take it back and bring a new one. Nothing like buying a new expensive item only to find it not in new/working order! We bought a leaf blower from Sears once. It CAUGHT FIRE within maybe 20 minutes, the first time we used it. They were good about the return (only an hour or two after we bought it), but it freaked me out to put the still smoking leaf blower in the car to drive across town and return it. I totally understand! We got a new washer and dryer last year from Lowes, and within a few months the dryer got so hot that it basically fried itself. The guy that came out said it was because we had lint built up. Maybe we had a little, but we cleaned it out and the same thing happened again after the guy left. Turns out it was a faulty thermostat, and nothing that we were responsible for. Then after that, our new dishwasher started spewing water out everywhere…during Thanksgiving week. It took forever to get someone out, only to tell us he would have to order a part and it would be another week. Everything is back to normal now, but sheesh! Just goes to show you they aren’t making these things like they used to! Holy cow that sounds like such a headache! We had nearly the exact same thing happen to us — our 20+ year old dryer broke, so we figured we’d get a new washer and dryer at the same time since it was only a matter of time before the washer died. When we got them installed, the new washer stopped working about halfway through its first cycle, after the installers left. I went back and forth with Home Depot & LG to get someone to come fix it/replace it (LG ended up taking the reigns) — turns out the machine wasn’t level. The repairman had to adjust the little feet on the bottom quite a bit to get it to work (and add a shim! ), but it’s been over a year now and it’s fine (though it still has a hard time with big blankets). Maybe make sure it’s level? The drum looks like it’s really wiggling around in there a lot when it’s making that noise. Good luck! It’s frustrating being without a good laundry solution for so long. Wish it was that simple! We laid a level on it and it looks perfectly level. Thanks for the tip though! Sleek! I like ’em! I’m a top loader fan as well and we actually just replaced our old Maytag with a new Maytag the day after Thanksgiving. (thank goodness ours decided to die when a sale was going on!) Just a warning, though, when you start cloth diapering that baby top loaders have a tendency to go off balance with that wonky load so I recommend only washing diapers when you’re home to make sure you can adjust if needed. Our front loaders are stacked and I loved them at first but am now thinking about putting them side-by-side and transforming the top into a counter – but it would probably end up being a catch-all like your first! I’m chuckling at the thought of you guys scrambling to lay the new floor while they bring the new units upstairs! Wouldn’t it have been easier to just slide your old units into the hall and lay the floor on your own time without being rushed? Those old beasts were SO HEAVY that we worried we’d scratch our beloved floors moving them out into the hallway (John gets all twitchy when you talk about potentially hurting his babies, haha!). So we thought having those boards pre-stained and sealed would mean it takes two seconds to drop them in. Would have been a lot easier if the carpet was as loose as it looked (that scrambling to scrape staples had us sweating bullets) but I’m so glad we got ‘er done! Wow, I woulda been throwing things and frothing at the mouth in a fetal position after spending so much money on a new toy and then realizing it was broken! Thanks for showing all your different washer set ups. One day when we’ve saved up enough money we want to redo our kitchen, but unfortunately that also involves redoing our laundry area and probably making it more open/public, so we need to figure out what to do with it. I like what you had in the first house but since we’ve always had a top loading washer I think bending over would get old fast. Maybe a trap-door section of counter, but then we’d have to keep that section cleared off (it’s also near the garage and would get random stuff put on it all the time). At least our budget limitations mean I can day dream for a few years yet, right? The nice thing about front loaders is that they’re more efficient and they are gentler on your clothes. I tend to just crouch down for a moment while loading or unloading. It doesn’t really bother me, personally. Maybe that’s because I already had to bend down to pick up all the stuff I always dropped. We have the same washer but the bigger capacity and within day of having it delivered we got an error could and it wouldn’t drain (in the middle of a load of cloth diapers! EWW!) We got ours at Lowes, had to wait for a maytag repair guy and just to be told it was an electrical problem and Lowe’s would need to replace it. It was super irritating to buy a brand new washer that immediately broke, but the new one has been wonderful since (knock on wood) and we were thankful it was all covered under warranty! :) I hope y’all still love it and have better luck with this next one! Aw thanks Alicia! Makes me feel better that the second time was the charm! OH NO! As someone who has been coveting new washer/dryers everywhere, I would have seriously cried once that metal grinding started. I’m using the in-laws old set, which is awesome because free but also a bummer because old. They’re loud (the buzzers on both haunts my dreams) and the dryer should really be called an almost dryer unless run for an hour or longer unless you’re doing towels in which case, good luck. My area, Eastern Washington, also leaves behind appliances when moving. The husband is already mourning our fridge and we aren’t even moving for a year or more. I feel your pain! Our washer broke last summer, a really ancient machine, so we called our property management company and our landlord agreed to have it replaced. Unfortunately they picked a very cheap brand and it began flooding our floor 3 weeks ago. It took 2 weeks to get a repairman out to fix it, and he determined that a forgotten coin had ripped through the tub, and the tub would have to be replaced. That will cost almost as much as the machine, and we are still waiting for them to return and fix it! And I think you’re right about the 3’s thingy – I fell down the stairs carrying my laptop and broke that, then our water pump went on the car, and now the washer…hopefully we’re done with all that! Oh Kerri, I’m so sorry! Hope the bad luck streak is over! When I got my new washer and dryer, the dryer had a little attitude. It worked in the since that it blew cool air on the clothes, but heat? Ha! Thankfully, it was a quick simple fix. Sears sent someone out the next day, and the guy found that there was just a wire disconnected inside the console up top. One little connection and a dryer that dries! I recently replaced my washer and dryer, and the same thing happened – everything seemed all fine and dandy when the installers were there, but when I went to run the first glorious load of wash, water started spraying everywhere from a hole in the plastic tube that drains water during the rinse cycle. Misery! Sadly, Lowes and GE were somewhat less helpful than it sounds like HD was for you guys. It took weeks (weeks!) more to get a service tech out there and get it fixed. Fortunately I have accommodating friends with functional washing machines. Did you guys remove the bracing bar from the washing machine before you installed it? We had the same thing happen to us with our new washing machine (different model though). We installed it and I did a load of laundry and it was incredibly loud and really rocking back and forth. After a little inspection we realized there is a metal bar/pin inserted through the back of the machine to stabilize it for moving that you’re supposed to remove before use (it goes internally through the washer, so you can’t see it in the basin). We took that out and it was good as new! Lesson: Always read those stickers that come on the back of appliances, apparently they actually have important info on them haha! Ours were installed by Home Depot and before he ran it he said it was all ready to go, so we don’t think they left anything in it. It only makes that sound on a certain cycle (the wash one, when the agitator moves) so it’s gorgeously silent and wonderful during filling and draining. Yay new machines, and hurray for fast turn-around to fix the washer! We moved to Switzerland last year, and I miss our US washer and dryer SOO MUCH! The machines here are smaller and use somewhat different technologies so they take at least TWICE as long to wash/dry as in the US. It is craziness. And I swear everything gets more wrinkly in these machines, even though I’m barely putting anything in one load (not even one set of queen-sized sheets and pillowcases can fit without tons of wrinkles). 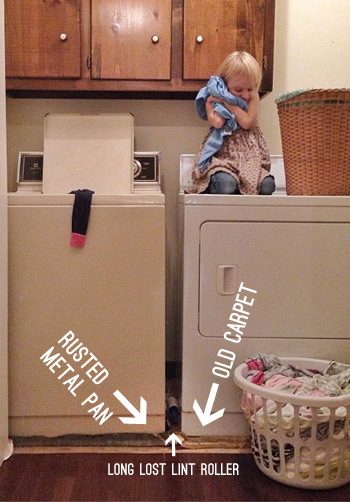 Rant over…just seeing your washer and dryer is making me all nostalgic! :) Ooh and great job on the fast floor change, awesome strategy! Are you tempted to take the washer out and paint the trim between now and Thursday, since it doesn’t work anyway? Or would that hurt the warranty? Sherry, I’m so sorry you’re still feeling so bad! I really hope it ends soon! Aw, thanks Lindsay! No matter what I won’t be pregnant much longer than 10 weeks, so I keep reminding myself I’m in the home stretch. Can’t wait to meet this little guy! Ok, now the real question. 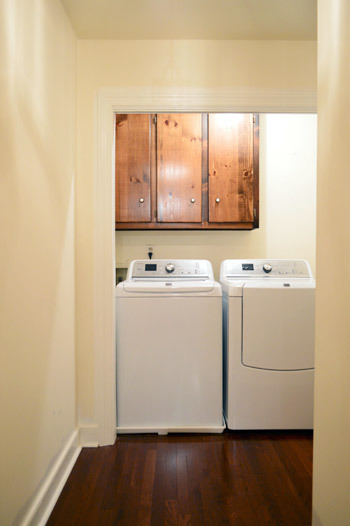 How do you like having the washer and dryer on the 2nd floor? I think it would be really nice not to have to travel up and down the stairs with baskets full of laundry, but at the same time, it would be nice on the first floor to have it on the same level where you spend most of your time and can hear the buzzer go off. I think we can all agree that basement laundry (which is what we have) stinks! We love it upstairs! It’s closer to our bedrooms than it ever was in either of our last homes (even when everything was on the same floor) and it seems easier to put things right away (sometimes piles would sit on our sofa waiting to be folded at our last house, but here they go straight into the bedrooms where they belong and get put away). Aww, bummer about the washer! Here’s hoping you guys get a positive resolution this week! My husband and I bought our washer/dryer set from our last landlord when we moved out (just gave us less back on our security deposit, so it felt like we were getting them for free! ), and we’ve been rockin that set for the last 5 years. I’m knocking on wood that they hold up for us until we’re ready to move out of state. They delivery guys said everything was removed and it was ready to go (they even started that first load to watch it fill and check for leaks) so we don’t think that’s the issue. I wish! That’s a real bummer! But maybe in the spirt of glass is half fullness, you could use this time to paint the blue trim in the laundry cubby? Either way, I hope it all gets worked out very soon. No washing machine is no bueno! Sounds like Thursday may be a good day to just get the blue trim painted and over with! If only it didn’t take four coats! I currently have front loaders in a laundry closet. The bending over is a hassle, but I love being able to put things on top of the washers. I have 4 laundry baskets for different types of loads. When a basket is full, in it goes. Makes sorting easy. I may switch to top loaders again, but I would need more laundry space. OUCH. Glad Home Depot was so great to work with you! Sorry to hear about the snafu, but the new appliances and the floor look really nice! Make them stick for the full cycle when the new one comes! Yay! Happy days are here again! I think it would definitely be a lot more work (the convenience of doing a load at home while making dinner or writing a blog post) was really nice. Maybe try it with one of those “rental trial things” from cloth diapering companies and see what you think before committing to buying them? I’ve had some great Home Depot customer service experiences too which surprised me. I guess I think of their appliances as not their main thing but I was really impressed with how they treated me and, technically, I wasn’t even a customer at the time! I had some trouble with the place I did buy from and their installation and HD was all over helping me get it rectified and verified what should have happened. I was really grateful they were so helpful when I hadn’t bought from them. And yes, I do know the sweet sweet pleasure of having a working washer/dryer again and how lovely clean clothes are! You really miss it when it’s gone! You got really lucky that HD was so accommodating. Hopefully the new washer works! I totally remember that debacle but forgot it was a Maytag! Eeks, I hope ours holds out after it’s replaced. That’s pretty genius with those floor boards – they look amazing. Are you planning to Sher-ify this with paint and cute knobs and all the fun stuff you guys always do to make these spaces updated and pretty? (Not that it needs it! 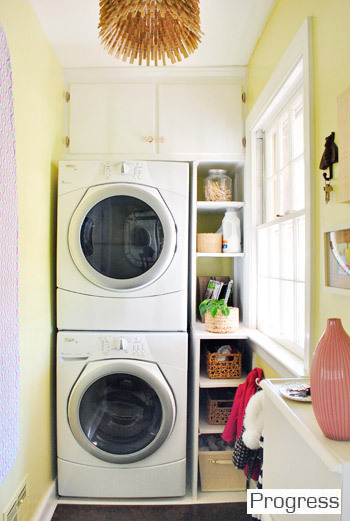 but you just always have cute laundry spaces). 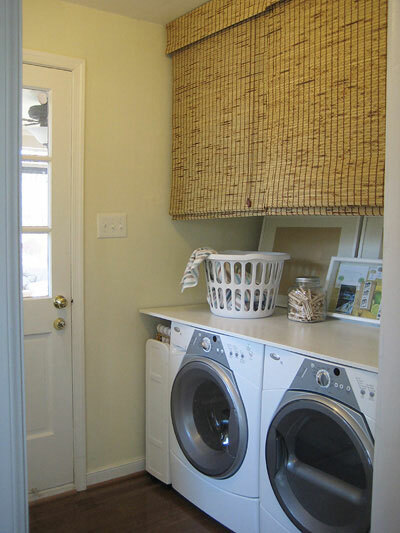 Will you add in shelving/a closet bar for hangers in the space above the dryer or do you have a piece of art in mind? Love these updates! I’m sure you’re looking forward to having the appliances in place and working. Hopefully that’s all sorted this week. Oh yes, it’s definitely on the to-be-spruced list sometime! We’re just focused on the nursery right now, but in the words of Arnold… I’ll be back! Do you guys have a laundry may near by? At least you could do a few loads all at the same time and get caught up. Thankfully John’s mom and sister live about 15 mins from our house, so if we get desperate we can fill the car with laundry and head over there. I just hate dropping in on them like that, so I think holding out until Thursday will work. Just hoping that Thursday goes well! 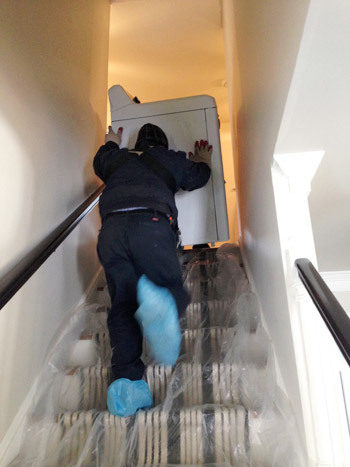 Been there, done that, feelin’ your pain with the new appliance issues! When we got a new washer/dryer combo the box was dented. I made them open it before it came 20 floors up. Sure enough, dented! And right where the washer drum would turn, so I didn’t want to risk accepting it. Two days later when they came with a new one, it was the EXACT SAME box! I refused to accept it again and they made me wait a week before they had an opening to try again. Finally got an undented appliance, they installed it, and ran the washer to test it. They left, I tried the dryer – Nothing! Called our building maintenance guy and he figured out the problem. My husband and I now laugh when we see commercials for the store in question – never again! So sorry to hear that out of the box you had issues… We’ve started looking for a new washer/dryer combo and I was looking forward to your review of this one. Side note- If you need a great small space laundry rack, I cannot stop raving about the Grundtal Drying Rack from Ikea- it’s stainless steel, is securely wall mounted and folds flat when not in use. We just installed two in our laundry room and I was promptly air drying 12 pairs of jeans, 2 sweaters and a few tank tops on them in no time! Love your site and I always look forward to your new posts! Sorry about your washer! I recently switched from front to top loader and I love the change. Long time reader, first comment just because I don’t understand why you and John didn’t remove the washer and dryer before the install? It’s an easy enough process and then you could have addressed the floor and trim without the “blind panic” and mad dash. Good luck with the replacement washer! They were beasts (super heavy) and we just worried we’d scratch up the floor in the hallway, which obviously is more beloved than the plywood floor in that nook, so we just got it pre-cut and stained it all so it was ready to drop in. We were sweating but we got it done in time, and didn’t have a scratch on those floors!